Our Raw Steel Spiral Rack allows you to display your apparel in a sweeping spiral adding a unique style element. This rack has a wide lightweight round base to allow for secure placement on your sales floor. Our Raw Steel Spiral Rack features a mottled brushed metal finish. All of our Boutique Clothing Racks come standard with flat caps. 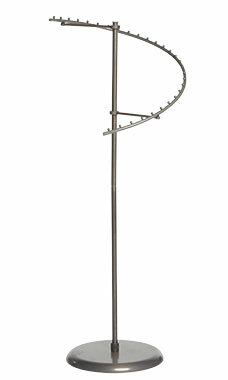 Customize your rack by adding one of our four Finial designs. Finials easily attach and detach at the top of rack allowing flexibility.